Top African Juniors in Botswana! The long-awaited Africa Junior Chess Championships start tomorrow at the President Hotel in Gaborone. The tournament starts at 3pm. Prior to kick off, Botswana National Sports Council (BNSC) chairperson, Dorcas Makgato- Malesu, will officially open the tournament at 12.30pm. Other speakers expected at the ceremony will include the Botswana Chess Federation (BCF) patron Andrew Sesinyi, BCF president Dabilani Buthali and Gaborone mayor, Nelson Ramaotwana. Botswana is expected to post good results in the championships. At a meeting on Wednesday, BCF decided to increase the number of Botswana participants from three to five in the boys' section. Three players will represent Botswana in the tournament. The boys' team has Providence Oatlhotse, Desmond Sesweu, Otlhomile Maruping, Bojosi Sabure and Nelson Morwamang while Ontiretse Sabure, Galaletsang Mooketsi and Peggy Raseipei will participate in the girls' section. The Botswana side is managed by Tshimologo Kolaatamo. The increase of participants in the boys' section is meant to give more players international exposure. As hosts, Botswana is allowed to field as many entrants as possible. In the event that the total number of participants is odd, Botswana has the option of fielding an extra player to make the field even for easy pairing. Coach of Botswana side, Baone Kealeboga is optimistic that his charges will excel at the championships. He pointed out that Botswana's chess is on the rise and there is no reason to doubt that the country would perform well. "I have a very young team which should do well for the country. Except for Oatlhotse and Ontiretse, all the other players can participate in this championship for the next three years. I am hopeful of a good performance," he said. The players are equally optimistic that they can triumph in an event that Botswana has never won. Ontiretse Sabure, who is a sister to African women champion Tuduetso, said that the preparations for this year's event have been good. "I am confident of winning a medal. We have a good coach who has taught us a lot in terms of theory, so there is every reason to believe we should win. We've never been better prepared," the confident Sabure said. She added that they have been attending the BNSC gym to be physically and mentally fit during the tournament. 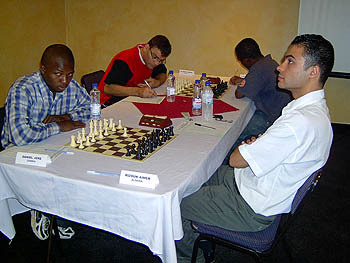 Daniel Jere (left) facing off against IM Aimen Rizouk at the 2005 African Individual Chess Championships. Eleven countries are expected to take part in the event. These include Nigeria, Angola, Malawi, Zambia, South Africa, Uganda, Egypt, Zimbabwe and Mozambique. A total of 40 players are expected for the tournament. 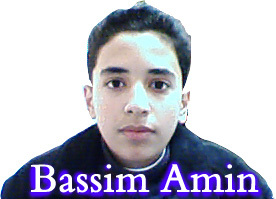 Egyptian International Master (IM) Baseem Amin is the highest rated player at the tournament with 2445. He aims to win the tournament to earn his final Grand Master (GM) norm. He is more than 250 points over the second highest rated player, Daniel Jere of Zambia. International arbiter, Webster Kafumbwe of Zambia will preside over the tournament assisted by Alex Mpuisang of Botswana, Simbarashe Morimi of Zimbabwe and Rupert Jones of England. The first two rounds will be played at the President Hotel. From 12th to 16th, the tournament moves to Tlotlo Conference Centre in G-West Phase Two. The event ends on December 22.